“I would suggest as a memorial to Mrs Thatcher that instead of the usual headstone or statue, a dance floor should be erected over her grave”. This was proposed by a writer to the Observer paper from Durham, a former mining area, on the 30th anniversary of her coming to power. Seeking to avoid the anger and opposition that a state funeral for Thatcher would invite the government is nonetheless planning a state funeral ’by any other name’. Having spared no venom to attack millions of low-paid, unemployed and disabled people forced to subsist on benefits, Downing Street discovered it had a delicate side and has declined to say how much the ’ceremonial funeral’ will cost the public purse. No doubt it will be in the millions. ’By your friends shall ye be known’ is a well-worn cliché but in Thatcher’s case it is insightful. Many have taken to social media to remind us of who Thatcher counted among her pals – murderous Chilean dictator Auguste Pinochet and former US president Ronald Reagan, her co-architect of brutal neoliberalism. But at the same time, politicians, press barons and editors are fawning and flattering in the praise they spew out for her as the prime minister who they say made Britain great again. She was nothing of the sort. Tory MPs and right-wing commentators on the BBC and elsewhere also use the opportunity to attack the trade unions. In analysing her role and legacy, we must start with de-bunking some popular myths. The film industry tried to sell the Iron Lady as a feminist icon. Thatcher was the first female prime minister but her reactionary policies set back previous advances towards women’s equality. Her commitment to ’Victorian values’ and belief that “there is no such thing (as society)” were the ideological justification for cutting public services and pushing the burden onto the family, which in most cases meant women. She opposed ’subsidising’ mothers to go out to work saying it would have discouraged them from staying at home to look after their children. Over half of Britain’s working women were denied the right to maternity benefits, paid maternity leave and shorter working hours. Publicly funded childcare fell to the lowest level in western Europe. While being a grocer’s daughter from Grantham rather than an aristocrat or millionaire may have made Thatcher more determined to succeed as a politician in an old-boys club, it was the economic and political conditions in Britain in the 1970s that allowed her right-wing policies to come to power rather than any personal qualities. Twenty years earlier during the post-war economic upswing and mixed economy consensus, she would not have become Tory leader or, if she had, not as a Thatcherite. But the economic stagnation and industrial strife of the 1970s meant that the ruling class abandoned the post-war settlement of mildly re-distributionist and Keynesian policies in favour of attacking the living standards and rights of the working class in order to restore the profitability of an ailing British capitalism. Thatcher, a convert to the monetarist, free-market ideology of Hayek and Milton Friedman, replaced the defeated prime minister and Tory ’wet’ Ted Heath in 1975, and won the general election in 1979. However, it was the Labour leadership that prepared the way for Thatcherism by starting to implement neoliberal policies in the 1970s. Thatcher won three general elections and stayed in power over eleven years, giving the appearance of being both popular and impregnable. However, she was neither. According to opinion polls, she was, during her time in office, actually the second most unpopular post-war prime minister. But the Labour leadership failed to take advantage of this. On the one hand it had failed to tackle the problems of the working class and on the other hand it had directed its energy against challenging the left, particularly Militant. In this it revealed its degeneration from a pro-workers’ party at bottom to what it is today, indistinguishable from the other pro-capitalist parties. After the 1981 inner-city riots her personal approval rating was only 23% and a Times headline read: “The most unpopular prime minister since records began”. 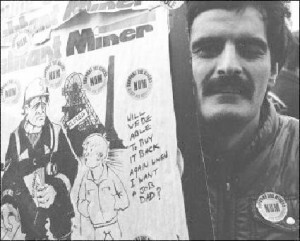 After defeating the miners’ strike in April 1985 the Tories were 5% behind in the polls and in April 1990, when the poll tax was introduced in England and Wales, they were 24% behind Labour! In other words, at the height of class struggles which polarised society, Thatcher was clearly seen as fighting for her class against the majority of society, the working class. Much of her perceived strength was actually the reflected weakness of the trade union and Labour leaders. While her 1983 election victory owed most to the so-called Falklands Factor, Thatcher jingoistically wrapping herself in the union flag to defeat the “enemy without” at the cost of hundreds of lives, the right-wing Social Democratic Party (SDP) split-off from the Labour Party and the beginning of the witch-hunt against Militant supporters (the forerunner of Socialist Party) meant that Labour was divided and seen as unelectable. Had the pit deputies union NACODS acted on their big strike ballot, had the docks and railway solidarity strikes lasted longer, and if the TUC leaders had called a general strike in support of the miners, then the Thatcher government could have been brought down in 1984/5 like the Heath government was in 1974. Even then, Labour leader Neil Kinnock lost his party’s poll lead by attacking NUM president Arthur Scargill and the Militant-led Liverpool City council in the run-up to the 1987 election. But Thatcher was beaten. Her government was forced to retreat in 1981 when the South Wales miners threatened to strike against pit closures. Liverpool City Council, by mobilising mass support for its policies of building houses and creating jobs, forced the Tory government to concede an extra £60 million funding in the summer of 1984. This was heralded as “Danegeld” by the Times – Danegeld was the tribute in gold demanded from the English rulers in the 13th century by the invading Danes in exchange for not engaging in pillage and plunder. Thatcher then used these retreats, although forced on her, to prepare more thoroughly to defeat first the miners and then ’left-wing’ Labour councils. 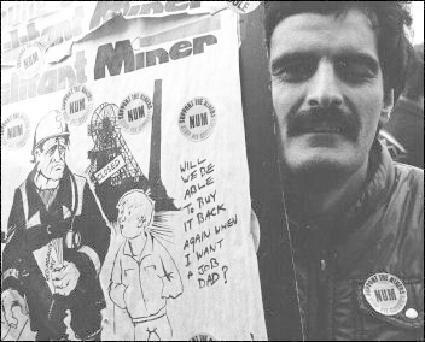 After winning the 1987 general election, Thatcher made the mistake of attacking all the working class at once by introducing the Poll Tax, a punitive and regressive charge on all adults for local services. She declared the ’Community Charge’ as her flag-ship policy. Militant warned it would be her Titanic. 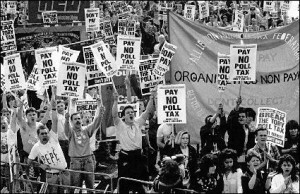 Starting in Scotland in 1989, where the tax was to be introduced first, Militant helped initiate a campaign of mass non-payment organised by anti-poll tax unions, which spread to the rest of Britain in 1990. 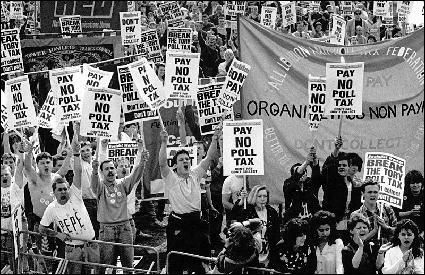 At its height, 18 million people were refusing to pay the poll tax, the biggest campaign of civil disobedience ever. Just after the so-called poll tax riots in Trafalgar Square (caused by the police attacking a 200,000 strong demonstration) the Tories were 24% behind in the opinion polls. Despite courts, bailiffs and jailings, non-payment grew making the tax un-collectable. What this showed is that all Thatcher’s perceived strengths, as a resolute, determined, single-minded strong leader, epitomised in her famous “You turn if you want to. The lady’s not for turning” speech, turned into their opposite when her divisive policies completely undermined social support for the Tory government. 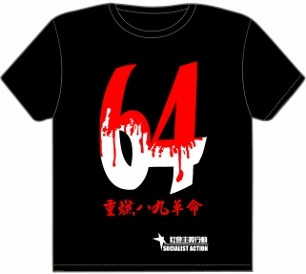 Decisive was the leadership offered by Militant in the campaign of mass non-payment. Then she was seen as arrogant, stubborn, pig-headed, and unwilling to listen to her cabinet, leading to Tory splits and her removal. In sinking the retreating Argentinian battleship Belgrano and in her year-long “civil war” against the miners, the “enemy within”, Thatcher displayed the brutal cold-heartedness of British capitalism. But she herself became the victim of the ruthlessness of her own ruling class. We’ll shed no tears for her demise. She will be remembered forever for destroying manufacturing industry and causing permanent mass unemployment. Her monetarist policies of high interest rates and slashing public spending turned the recession in 1979-81 into a depression. Manufacturing output fell by 30% by 1983. Industries like steel, coal and engineering were decimated and whole communities with them. The former ’workshop of the world’ became a net importer for the first time since the industrial revolution. Unemployment rose by over a million in just one year, peaking at 3.3 million in 1986 with a ’lost generation’ of young people thrown on the scrap-heap. Thatcher, representing finance capital, believed that de-regulation, especially of the City, would lead business to prosper and wealth would “trickle-down.” Combined with the proceeds of the selling off of council housing and mass privatisations of public utilities, there was the appearance of growing prosperity reflected in the ’yuppie’ and ’loadsamoney’ culture but this was superficial and only ever benefited a small minority. Her much-vaunted “share-owning democracy” never materialised, as workers quickly sold their shares and the financial institutions became the ’masters of the universe’. By the end of the 1980s, 12.2 million people, over a fifth of the population, were living in poverty, and the gulf between the richest 20% and poorest 20% had widened by 60%. This increase in inequality was to widen further under Blair’s New Labour government as it continued Thatcherite policies of curbing the trade unions, privatising state resources and deregulating the City of London. 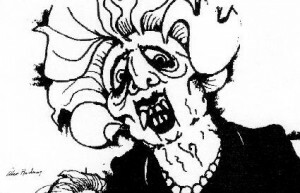 In 2001 Labour’s Peter Mandelson tellingly said: “we are all Thatcherites now”, before enthusing that he was “intensely relaxed about people becoming filthy rich”. Thatcher herself claimed that New Labour (Labour’s conversion to capitalist neoliberal policies) was her greatest legacy and Labour leader Ed Miliband has praised some of Thatcher’s key policies, stating: “Some of what happened in the 1980s was right. It was right to let people buy their council houses. It was right to cut tax rates of 60, 70, 80%. And it was right to change the rules on the closed shop, on ballots before strikes. These changes were right, and we were wrong to oppose it at the time.” This complete capitulation to the market has now led Labour to accept the Con-Dem coalition cuts and pay freeze, making the need for a new mass workers’ party even more urgent. It is fitting that Thatcher should die at the very time when free market capitalism, in the middle of its worst economic crisis for 80 years, has so spectacularly failed. 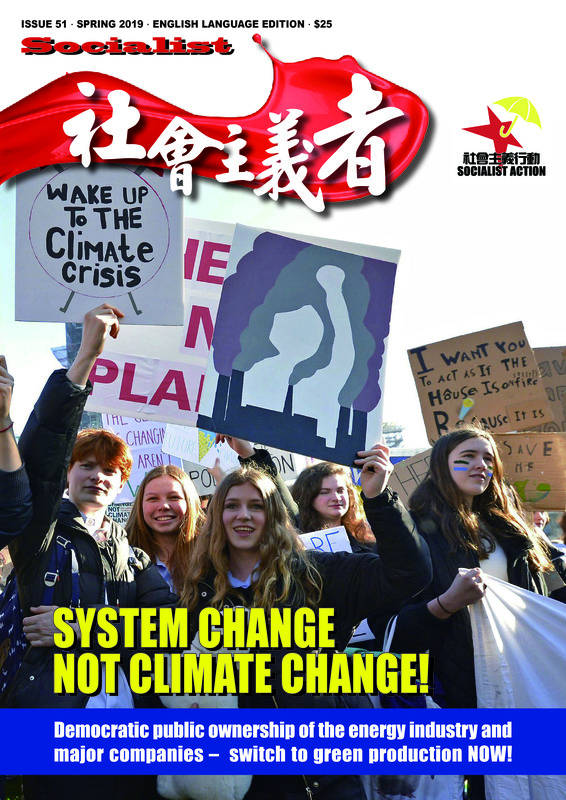 She sought to “roll back the frontiers of socialism” but it is now those very ideas of socialism that will make a comeback as increasing numbers of workers and youth look for an alternative to the austerity, war and environmental destruction that is global capitalism today.